No other group of mammals conjures up as much fear and mythology as bats. Next to the rodents, bats represent the second largest order of mammals, with 900-1100 species depending on which authority you adhere to. This diverse group is subdivided into two suborders: the Megachiroptera (Old World fruit bats) and the Microchiroptera (about 80% of species and found worldwide). Bats inhabit every continent except Antarctica and can be found in habitats ranging from forest to desert. Bats are crepuscular (active at dusk and/or dawn), nocturnal or a combination of both and they occupy a variety of ecological niches. All bats found in North American are able to navigate in complete darkness; in essence using sound to “see.” This orientation system is termed echolocation and involves the production by the larynx of typically short (5-20 milliseconds) intense ultrasonic sounds. Ultrasonic means simply that the sounds are above the range of typical human hearing, although the spotted bat echolocates using frequencies that most humans are able to hear. Most calls are frequency modulated, which means that as the call proceeds, the frequency sweeps downwards (like moving right to left on a piano keyboard). For most Canadian bats the range of frequencies used is between 120 and 20 kilohertz (a kilohertz equals 1000 cycles per second). Echoes result when these sounds bounce off objects and potential prey. These echoes provide the bat with information about an object’s size, shape and distance. The lower the frequency of echolocation call, the farther sound (and thus echoes) carry and thus the greater the distance that the bat can detect objects. The downside to lower frequency calls is that it makes detecting small objects (insects) more difficult. Echolocation calls are also used for communication and some bats eavesdrop on other bats to locate concentrations of insects or potential roosting sites. Besides ultrasonic calls, many bats make an assortment of audible clicks and chirps used for behavioural interactions, such as between a mother and her young. Contrary to popular mythology, there are no blind bats and eyesight is likely more important to many bats than once thought. It is unlikely that bats are able to detect echoes from their calls at distances greater than 20 m, so vision may be important for long distance movements and migration. Bats hang upside down to roost (rest). They have sharp claws on the toes of their hind feet, useful for gripping. When at rest, bats usually fold their wings against the sides of their bodies although Megachiropterans enfold their body in the wings. Bats in temperate areas have two strategies to cope with winter when it is cold and insects to eat are unavailable. Some bats, such as the red, hoary and probably the silver-haired, migrate south like birds to warmer areas; where they may remain active or hibernate (in most cases we just don’t know!). Other species hibernate rather than migrate. Living off stored fat, they hibernate in sheltered spots, including caves, abandoned mines or deep rock crevices. We know the locations of only a few hibernation sites in western Canada. All bats found in Canada eat arthropods only and their diet consists principally of insects. They typically consume large numbers of “bugs”. Nursing females probably eat their own body mass in food each night during the summer. Most bats capture flying insects which they detect using echolocation. Due to their high energy requirements, bats have evolved means of capturing and processing large numbers of insects rapidly. Many species are able to rapidly exploit ephemeral concentrations of food. They can chew rapidly, up to 7 times per second. The big brown bat has been recorded to attack an insect every three seconds during some feeding bouts. This is impressive when one considers that in that time, the bat must chew a captured insect and both detect and manoeuvre in the air to attack the next one. Although bats eat a wide variety of insects, different species tend to eat different types. Little brown bats mainly eat small, soft-bodied insects such as midges, caddisflies and moths; which they often catch over calm bodies of water. Hoary and big brown bats are larger, stronger fliers with more powerful jaws and lower frequency echolocation calls meaning that they are able to detect and eat larger, harder-bodied prey, such as beetles. Both hoary and big brown bats tend to forage above fields, trees, water and other open spaces. They tend to eat moths, beetles, termites, caddisflies, lacewings, carpenter ants and midges. The little brown bat is likely the most common species in Canada. It ranges from the southern border with the US to tree-line right across the country and is found in various habitats: dry grasslands, forests and even cities. However, water is never far away. Females typically roost in groups, often called maternity colonies, to bear and raise their pups. Roosts occur in tree cavities, under bark, in attics, under shingles, behind shutters and in rock crevices. Males are likely more solitary, but frankly we know little about what they do in the summer. In the winter, little brown bats hibernate in caves, abandoned mines or in deep crevices in rocks. They sometimes travel hundreds of kilometres to a suitable hibernation site, often returning there year after year. Most small mammals produce large litters at an early age and are short-lived. Bats are different: they tend to have few young and live to a ripe old age. Little brown bats have been recorded to live for more than 30 years in the wild. Most bats in Canada give birth to only one young per year, although twins are also known. Red bats are the exception. Females of this species give birth to as many as four young per litter. For little brown bats, about whom we know the most, mating takes place through the fall and even winter at the hibernation site. After mating, females nourish live sperm within their bodies and do not actually become pregnant until leaving the hibernacula in spring. Gestation is 7-10 weeks. Young are large when born, often representing 25-30% of their mothers mass. Parental care is solely the responsibility of the females who suckle the young like all mammals. Males are not even present in the maternity colony. Pups usually can fly and forage for at least some of their own food by the time they are approximately one month old. They must learn to forage and fatten to survive the first winter, typically the period of highest mortality for bats. The hoary bat which has almost as extensive a range as the little brown represents the other end of the continuum of life history strategies. Sometimes called tree bats because they roost near the ends of branches, they are rarely seen except during migration. In May and June, hoary bats migrate north like many birds, usually to forested regions. Females don’t roost in groups, but by themselves until giving birth to their pups. Between August and October, hoary bats migrate south likely to hibernate, but we are unsure. Bats help control insect populations. Insectivorous bats are one of the main predators of nocturnal flying insects. Although a female bat can produce many offspring over her lifetime, most species give birth to only one young per year. 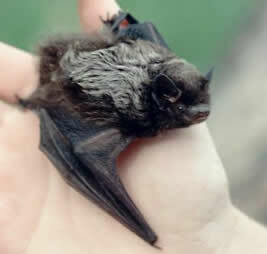 Consequently, if many bats die or are killed within a short time frame, the population may not recover for many years. Their modest birth rate can leave bat populations susceptible to extirpation (local extinction). Bats have few non-human predators, though raccoons; skunks, weasels, martens, cats, snakes, hawks and owls occasionally take a few. Humans pose the biggest danger to bat populations. Some people who fear bats will go out of their way to kill them. Because many bat species are colonial (live together in large groups), large numbers can easily be destroyed. Even people who do not mean to cause harm may do so accidentally. If hibernating bats are disturbed, they awaken. Arousal from hibernation consumes much energy, and increases the possibility that the bat’s stored fat will be insufficient to keep it alive for the rest of the winter. Humans impact bats in other ways. Bats eat millions of insects over their long lives. If these insects have been treated with insecticides, toxic compounds can accumulate in the bat’s fatty tissues. These toxins can harm or even cause death in high concentrations. Deforestation is another human activity that can affect bats. Logging reduces the availability of roosting places. Many people are afraid of bats because of a perceived common association with rabies. This disease also affects many other mammals, including skunks, foxes, raccoons, dogs, cats, cows and pigs. Any infected mammal can pass on the disease by biting because the virus causing the disease occurs in saliva. Rabies is dangerous because it causes paralysis and death unless quickly treated. If you notice any animal acting strangely—including a bat—stay well away from it. The only means most animals have of defending themselves is by biting. Any bat lying on the ground should be treated with suspicion. Do not touch it and report it immediately. The good news is that if given promptly, post-exposure rabies vaccinations are virtually 100% effective. Many species of bats are potentially at risk in Canada due to a variety of factors including limited distribution, habitat loss due to activities such as logging, environmental contaminants, direct extermination, and an emerging threat– wind turbines. Unfortunately we have no long term data on population numbers so it is impossible to come to definitive conclusions about the status of species. Read Mark's book, the Bats of British Columbia, for more information on this exciting group of animals. Barclay, R.M.R., and R.M. Brigham (eds.). 1996. Bats and Forests Symposium, October 19-21, 1995, Victoria, BC, Canada. Working Paper 23. Research Branch, BC Ministry of Forests. Victoria. Bogan, M.A., P.M. Cryan, E.W. Valdez, L.E. Ellison, and T.J. O’Shea. 2003. Pp. 69-77 In Monitoring trends in bat populations of the United States and Territories: Problems and Prospects (T.J. O’Shea and M.A. Bogan, eds.). U.S. Geological Survey, Biological Resources Discipline, Information and Technology Report 2003-0003:1-274. Brigham, R.M. 1991. Flexibility in foraging and roosting behaviour by the big brown bat (Eptesicus fuscus). Canadian Journal of Zoology 69:117-121. Brigham, R.M., M.J. Vonhof, R.M.R. Barclay, and J.C. Gwilliam. 1997. Roosting behavior and roost-site preferences of forest-dwelling California bats (Myotis californicus). Journal of Mammalogy 78:1231-1239. Brigham, R.M., E.K.V. Kalko, G. Jones, S. Parsons, and H.J.G.A. Limpens (eds.). 2004. Bat echolocation research: tools, techniques and analysis. Bat Conservation International. Austin. Fenton, M.B. 2003. Science and the conservation of bats: where to next? Wildlife Society Bulletin 31:6-15. Grindal, S.D., and R.M. Brigham. 1999. Impacts of forest harvesting on habitat use by foraging insectivorous bats at different spatial scales. Ecoscience 6:25-34. Hayes, J. P. 2003. Habitat ecology and conservation of bats in western coniferous forests. Pp. 81-119 in Mammal Community Dynamics in Coniferous Forests of Western North America: Management and Conservation (C.J. Zabel and R.G. Anthony, eds.). Cambridge University Press, Cambridge. Humphries M.M., D.W. Thomas, and J.R. Speakman. 2002. Climate-mediated energetic constraints on the distribution of hibernating mammals. Nature 418:313-316. Kalcounis, M.C., K.A. Hobson, R.M. Brigham, and K.R. Hecker. 1999. Bat activity in the boreal forest: importance of stand type and vertical strata. Journal of Mammalogy 80:673-682. Kunz, T. H. and M. B. Fenton (eds). 2003. Bat Ecology. University of Chicago Press, Chicago. Lacki, M.J., J.P. Hayes and A. Kurta (eds). 2007. Bats in Forests: Conservation and Management Johns Hopkins University Press, Baltimore. Medillin, R.A., M. Equihua, and M.A. Amin. 2000. Bat diversity and abundance as indicators of disturbance in Neotropical rainforests. Biological Conservation 14:1666-1675. Nagorsen, D.W., and R.M. Brigham. 1993. Bats of British Columbia. Royal British Columbia Museum Handbook. Volume 1. The Mammals of British Columbia. UBC Press, Vancouver. Vonhof, M.J., and R.M.R. Barclay. 1996. Roost-site selection and roosting ecology of forest-dwelling bats in southern British Columbia. Canadian Journal of Zoology 74:1797-1805. Willis, C.K.R., and R.M. Brigham. 2004. Roost switching, roost sharing and social cohesion: forest-dwelling big brown bats, Eptesicus fuscus, conform to the fission-fusion model. Animal Behaviour 68:495-505. Wilson, D.E., and S. Ruff. 1999. The Smithsonian Book of North American Mammals. Smithsonian Inst. Press, Washington.